Sheriff, is a blown glass pop comic figurine with a passion for comedy. 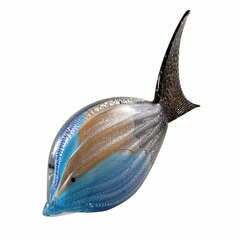 Created by Roberto Beltrami, in Murano glass. Sandy crabs, is a blown glass pop comic figurine with a passion for comedy. 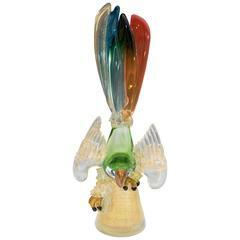 Created by Roberto Beltrami in Murano glass. 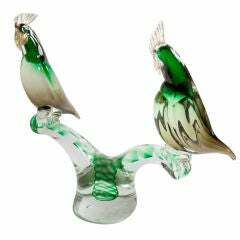 Beautiful green Murano glass sculpture with gold speckle of two parrots resting on a branch, Italy, circa 1960. AVeM vase, artistic blown Murano glass multicolored and red, circa 1950. With aventurine and silver. With certificate of originality. 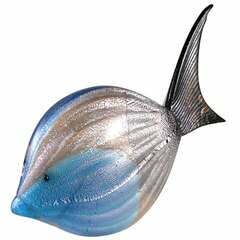 Rare Murano glass fish sculpture with a fused blue, black and gold body Finished with an aventurine Detail, 1960s.